姜黄如何影响肝炎 How Does Turmeric Impact Hepatitis? Curcumin (Curcuma longa) is the source of the spice turmeric, and is used in curries and other spicy dishes from India, Asia and the Middle East. Curcumin is what gives the curry its characteristic bright yellow color and strong taste. Holding respected positions in Ayuverdic Medicine and Traditional Chinese Medicine, turmeric is an herb that these time-honored institutions consider able to cleanse the body and invigorate congealed blood. An increasing amount of attention is being paid to turmeric’s health benefits, as modern-day scientists recognize its anti-inflammatory properties and find a growing list of illnesses that its active ingredient benefits. A controlled trial in India administered 500 mg of curcumin for seven days at Amala Cancer Research Centre in India. Researchers found that 29 percent of participants experienced an increase in good cholesterol (HDL), while 11.6 percent of participants had a reduction of total cholesterol. Additionally, lipid peroxidation, the process by which cells incur damage, was found to be reduced by 33 percent. Another study by the Faculty of Pharmacy at the University of Granada reported that curcumin was effective in inhibiting LDL oxidation and lowering LDL cholesterol and triglycerides. According to the latest research, curcumin reduces cholesterol by interfering with intestinal cholesterol uptake, increasing the conversion of cholesterol into bile acids, and subsequently increasing the excretion of those bile acids. Another 2000 study shows that a daily oral administration of curcumin extract significantly decreases LDL and apo B (a leading heart disease risk factor) and increases the HDL and apo A of healthy subjects. Whenever cholesterol ratio improves (HDL is raised, or LDL, triglycerides or total cholesterol are lowered), the strain on the heart and liver is reduced. For a person with chronic hepatitis, minimizing any additional strain on the liver is crucial for assuring longevity. Since a strong immune system is a person’s best hope for defeating infection with any virus �C including hepatitis �C immune modulators are consistently being sought. Immune modulation is an emerging field in the medical treatment of viral infections. By introducing an agent into the body that boosts specific areas of the immune system, immune modulators likely lead to an increase in ability to fight off viral infections. While pharmaceutical companies are racing to manufacture the best immune modulator for the different hepatitis viruses, naturally occurring modulators are much cheaper and typically free of side effects. As reported in the January 2007 edition of Journal of Clinical Immunology, curcumin demonstrates immune modulation activity in immune system cells. According to researchers G.C. Jaggetia and B.B. Aggerwal, “curcumin’s reported beneficial effects in arthritis, allergy, asthma, atherosclerosis, heart disease, Alzheimer’s disease, diabetes, and cancer might be due in part to its ability to modulate the immune system.” The potential curcumin has demonstrated as an immune modulator renders it a logical, inexpensive, all natural choice for helping defeat hepatitis. Protects Against Acute Liver Damage �C A Mexican study found that livers of rats treated with curcumin were protected from liver damage induced by carbon tetrachloride. Researchers concluded that by inhibiting NF-kappaB activation and thus inhibiting the production of pro-inflammatory cytokines, curcumin protected against acute liver damage. 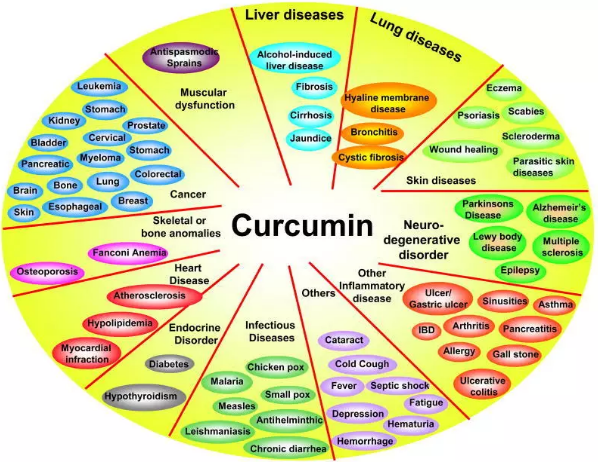 Protects Against Liver Cirrhosis �C An Israeli study found that curcumin protected rats against the development of liver cirrhosis as induced by thioacetamide. Researchers concluded that by inhibiting the expression of tumor necrosis factor alpha (TNF-alpha), hepatic stellate cell activation and collage alpha 1 (I) gene expression, curcumin demonstrated a reasonable ability to slow the development of liver cirrhosis. With documentation that this herb minimizes inflammation and slows cirrhosis, curcumin has the ability to quell potential damage from hepatitis. As the main ingredient in curry, many mistakenly assume that large quantities of turmeric are completely safe. While traditionally safe at low doses, excessive intake of curcumin may irritate the stomach lining. People who have been diagnosed with gallstones, have a bile obstruction or are pregnant should only commence with supplementation under the guidance of a qualified practitioner. Additionally, curcumin has a blood thinning effect; therefore it can be dangerous if combined with blood thinning medications. If taking a blood thinner such as coumadin, warfarin or aspirin, supervision is required for curcumin supplementation. As long as you heed its cautions and double-check your intent with a physician, supplementing with curcumin can offer a person with hepatitis great benefit. Ranging from its ability to improve cholesterol ratios, promise as an immune modulator and demonstration as a liver protector, curcumin is emerging as an ideal herbal supplement for a person living with hepatitis.